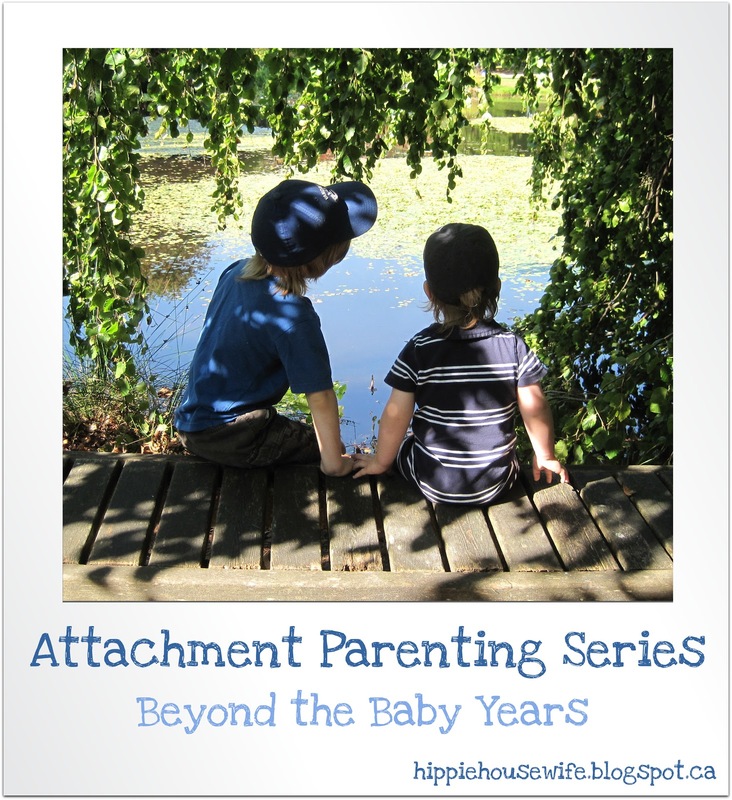 Today in our Attachment Parenting Series, we will be discussing Attachment Parenting beyond the baby years. If you have written a post on Attachment Parenting children, please do share it with us in the comments below! Attachment Parenting during the baby years is fairly straightforward. While the specifics and application varies with each individual family, the seven "Baby B's" provide a basic foundation to caring for a baby with an attachment focus. Once the toddler years hit, however, many parents are caught off-guard. Parents often find themselves without the practical tools nor the underlying philosophy needed to carry on with AP as their children grow. Suddenly nursing isn't the answer to every difficulty. Crying becomes more difficult to solve. Discipline becomes a challenge. Some parents, unsure of how to navigate their child's big feelings, begin resorting to time outs and other punishments. Others, accustomed to meeting their infant's every need, carry this dynamic into the older years in the form of appeasing their child's every desire. Both of these responses, punitive and permissive, fail to meet the needs of the child or to strengthen the parent/child relationship. As with Dr. Sears' seven "Baby B's", the specifics and application of each of these principles will vary according to the unique needs of the individual family. Browse through each article to get an idea of how the principles may be applied in your home. Far more than merely the decision to breastfeed or co-sleep, however, the core of Attachment Parenting is the promotion of a responsive, relationship-based approach to raising children. It encourages the parent to respond sensitively to their child's needs, seeking ways to build and strengthen a mutually-trusting parent/child relationship. With that in mind, the parent can better determine the specifics in a way that is right for their family. Each AP tool serves to strengthen and build on this relational foundation. Not every family will use every tool or use them in the same way. It is the heart behind the tool – the desire to respond sensitively to the child's needs and to seek ways to build and strengthen a mutually-trusting parent/child relationship – that is of true importance. 1. Focus on solutions: Rather than relying on threats, punishments, bribes, or rewards to control our children's behaviour, keep the focus on seeking solutions. This will allow the parent to discipline the child in a positive, proactive, and connective manner. Provide the child with the opportunity to fix their errors by having them brainstorm solutions and be responsible for making amends. This responsibility should be given to them at increasingly greater levels as they grow. 2. Teach skills: As with focusing on solutions, teaching skills will assist our children in navigating life in a way that keeps their dignity intact. The skills range from the most basic (taking turns, cleaning up messes) to the more complex (problem solving, conflict resolution) We are to actively teach, guide, and disciple them to maturity. Teach them what to do instead of what not to do. Model these life skills as well, and narrate decision-making processes out loud for children to overhear and learn from. 3. Accept emotions: Keep in mind that happy is not the only acceptable emotion. Children will face a number of strong emotions throughout their lives. On the one hand, your job is not to keep your child happy at all costs; on the other, a child should never be shamed or punished for feeling and expressing negative emotions. The goal is to teach them healthy ways to understand, express, and work through those emotions. Parents should not allow the presence or absence of tears to dictate their decisions, but should always come alongside the child to support them through those times using reflection and empathy. Remember that crying is not always something that needs to be fixed. 4. Strengthen relationships: All of our efforts will be futile without a strong parent/child relationship as the supporting foundation. Connect through physical touch, verbal affirmation, and focused quality time. For more detailed practical tips, refer to The Hows of Discipline and Gentle Discipline for Toddlers. As mentioned earlier, the two potential downfalls of AP parents who are leaving the baby years include punitive parenting on the one side and permissive parenting on the other. An AP parent who lacks positive discipline tools may fall back on the popular punitive model in an effort to clamp down on troublesome behaviour. Punitive parenting seeks to modify a child's behaviour through punishment. It is an adversarial style of parenting where the parent comes down on the child from above with the goal of controlling and conquering, rather than coming along side the child to connect and disciple. Parent and child are pitted against each other instead of placed on the same team. A reliance on punishments, however, controls only the outward behaviour and fails to instill strong internal motives. By design, punishment prevents the child from accepting responsibility for their actions, taking ownership of the problem, developing problem-solving skills, and making amends for their mistakes. In contrast, permissive parenting neglects to provide children with the safety of consistently enforced boundaries. Permissive parenting may rely heavily on praise to achieve the desired results, but the absence of punishment fails to make this a positive parenting technique. This is the more common downfall for the AP parent who, having acknowledged that a baby's needs and wants are very much the same thing and being accustomed to meeting their baby's needs in a sensitive and responsive manner, carries the same attitude over into the toddler and older years. Even though the child's wants and needs are no longer one and the same, the parent continues to act as though they are. Children thrive best within a framework of healthy boundaries. Without these limits, the child will act out in search of them, seeking their safety and predictability. It is this desire for predictable boundaries that makes punishment-based parenting programs appear to work. The parent is instructed to consistently punish the child when they overstep a boundary, and it is this consistency, rather than the punishment itself, that has positive results. Unfortunately, the physical and emotional pain that accompanies punishments has many negative results, and the child will internalize this bad along with the good. Much of what is considered punitive parenting is actually permissive parenting. Rather than calmly and consistently enforcing age-appropriate boundaries, this style of permissive parent allows the child to overstep boundaries over and over again until the parent explodes with frustration and overreacts, coming down strong to get the child's behaviour back in line. This may happen with no warning, leaving the child walking on eggshells for fear of triggering the unexpected annoyance, or it may happen after several unenforced warnings. This latter sort of inconsistency is equally confusing the child, who never knows when the parent "really means it" and when it's just one in another long stream of baseless warnings, culminating in the final punitive enforcement when the parent decides they've had enough. Attachment Parenting is incompatible with both of these parenting styles. It eschews the punitive response, with its focus on external behaviour above the internal, as well as the permissive response, with its lack of consistently-enforced age-appropriate boundaries. Attachment Parenting focuses instead on building the parent/child relationship and, from the mutual trust and respect that arises from that relationship, coming along side the child to teach and guide them to maturity. Attachment Parenting can be fairly straightforward during the baby years, but many parents are caught off-guard by the more difficult demands of parenting children. While the eight "Principles of Parenting" offered by Attachment Parenting International can provide a starting point, which parents can then implement in a way that meets the unique needs of their family, it is helpful to first have an understanding of the underlying core of AP. The heart of AP is the promotion of a responsive, relationship-based approach to raising children. It encourages parents to respond sensitively to their child's needs, seeking ways to build and strengthen a mutually-trusting parent/child relationship. To maintain this responsive and relational focus, there are four keys that can provide positive direction. First, focus on seeking solutions rather than imposing consequences. Second, teach the child useful life skills, such as problem-solving and conflict resolution, rather than focusing on instructing the child on what not to do. Third, assist the child in understanding, expressing, and working through their emotions in healthy ways, rather than allowing either parent or child to be controlled by the child's emotions. Finally, always seek to strengthen the parent/child relationship through the use of physical touch, verbal affirmation, and focused quality time. This parent/child relationship is not adversarial, with the parent coming down from above to control or conquer, but rather places the parent and child on the same team, with the parent coming along side to connect and disciple. Conversely, the parent/child relationship is not indulgent, with the parent seeking to appease the child's every desire, but instead aims to provide the child with the security of consistently-enforced boundaries while providing them with the skills and support needed to grow into maturity. By avoiding the dangers of both punitive and permissive parenting, the AP parent is free to focus instead on building the parent/child relationship and, from the mutual trust and respect that arises from that relationship, coming along side the child to teach and guide them to maturity. Very well explained. I only wish there were more resources in regards to taking criticism when you are an ap mom/dad. There is one family member in general that-I think due to cultural issues-is completely appalled by our parenting style. It's sad and frustrating, but the hate that has come from her has led us to realize it is more important to try and be our best selves for our son, and not involve that kind of hate in our/his life. To Eden, It's so hard when family members don't support our parenting choices, but someone has to be the trailblazer if anything is ever going to change, and it's never easy being a trailblazer! I battled pretty much everybody in my choice to pursue attachment/gentle parenting, including my husband right at first. It was hard, don't get me wrong, but very well worth it. I simply employed my gentle parenting tactics with the naysayers (i.e. I listened, showed them grace, validated their feelings, and firmly and consistently, but gently, enforced my boundaries. 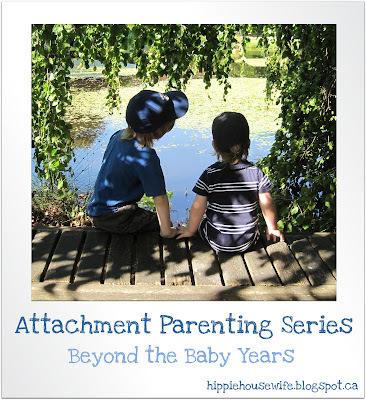 This post has summed up attachment parenting beyond babyhood beautifully, so I'll just add a link to my signature about some ways to handle transitioning into a gentle parenting relationship in the later childhood years when many parents are beginning to reap what they sowed through disconnected, punitive parenting in the early years and want to reconnect and heal their relationship with their children. I totally blogged about this a while back. The post can be found here. Eden, that is hard. I've had to face a lot of that criticism from family as well. I've become very good at changing the subject and, for those who can't leave it at that, enforcing strong boundaries. Rather than engaging in an argument, I try to step back and let time demonstrate the fruit of this style of attached parenting. It's also been very helpful for me to find supportive like-minded mothers that I can spend time with; I leave those playdates feeling refreshed instead of discouraged by all of the negative talk in my other parenting circles. Great idea for a future post in the series! I love the conclusion you've come to, about realizing how important it is to prevent that same kind of hate in your son's life. Little Hearts, thank you for those wise and encouraging words. I really appreciate the perspective you took on transitioning into gentle parenting in the later years. Thanks for sharing that. Regi, what a wise post! Love the way you approached the topic. Thanks for sharing! Thanks to you all for the support, it really does help. I attend regular LLL meetings and they are amazingly supportive and reinforcing of our family's parenting style. By the way, I would love a post of AP-handling criticism. In the mean time, we will hold strong on breastfeeding, co-sleeping and treating our baby with respect, not matter how mad she gets!!! I recently realized my 3 1/2 yo and I had gotten into a dramatic loop around the issue of pee...she's taken to having accidents and it feels like she doesn't care enough to make her pee go in the toilet. I was reacting to her like she was doing this rude, disrespectful thing by peeing in MY house where I have to clean it up. True, sort of, but not helpful and also not the whole story (we have a 4 month old baby, and potty learning is not the only thing that's fallen through the cracks). Anyway it had become this big argument to get her to sit on the toilet and still it didn't help...very frustrating. Aw, Kate, your daughter's reply was so sweet! Thanks for sharing that! Great blog, love this AP series!! I love that you write about the flexibility of AP! !